The war would continue for four years into the decade, then the problems of demacracy would begin. It didn't take a day or year to hammer out the details of how thirteen disparate colonies would join as one nation, in a form of government never tried before. It would take until the end of the decade for them to elect, indirectly, the first president, George Washington, and see the experiment begin in earnest. What's going on to protect and interpret American Revolution historic sites. Great news on two interesting fronts. Get off the beaten path. Walk the land of the national historic or state historic site in the early morning or when twilight is nigh, when the exhibits are closed, and imagine what life was like during the time when history was made there. Photo Princeton Battlefield, New Jersey. 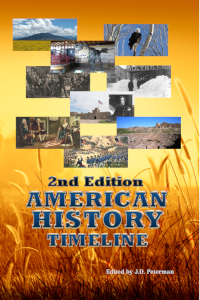 Buy the America's Best History Timeline Now in easy to read, print, and search digital format for your Kindle, Nook, or computer. Also now available in Paperback. Top: George Washington. Commander of the Continental Army and 1st President of the U.S.A. Courtesy NARA. Right: Surrender at Yorktown. Courtesy Library of Congress. Sponsor this page for $125 per year. Your banner or text ad can fill the space above. May 12, 1780 - Charleston, South Carolina falls to the British after an effective siege. Prompted by poor vision both near and far, and tired of putting his glasses on and off, Benjamin Franklin invents bi-focals. It is unknown exactly when this occurred, with Franklin admitting to friends that he had been wearing double spectacles in 1784. July 11, 1780 - French troops set foot on American soil at Newport, Rhode Island, to fight alongside the Patriot militiamen of the Continental Army for American independence from Great Britain. September 25, 1780 - The march begins this date at Sycamore Shoals on the Watauga River (Tennessee) by the “over-mountain men” militia of the American Revolution under Colonels James McDowell, John Sevier, Isaac Shelby, and William Campbell as they move toward the Battle of Kings Mountain in South Carolina. October 7, 1780 - Loyalist troops fighting for Britain are beaten at the Battle of Kings Mountain by the over-mountain men, who kill the opposition leader British Major General Patrick Ferguson. This battle reversed the southern fortunes of the British during the Revolutionary War. January 17, 1781 - At Cowpens, South Carolina, Brigadier General Daniel Morgan with his band of Patriot militia defeat the large force of British regulars under Lt. Colonel Banastre Tarleton. This engagement in the southern sphere of the American Revolution provided a key victory for American forces. March 15, 1781 - British troops under Lord Cornwallis gain a costly victory at the Battle of Guilford Courthouse in North Carolina at the expense of Major General Nathanael Greene in the opening salvo of the campaign that would lead to Yorktown. May 22, 1781 - Major General Nathanael Greene and Harry "Light-horse" Lee leads the Continental Army against British loyalists in a siege at Ninety-Six, South Carolina. They are repulsed and forced to withdraw on June 18 when Colonel John Cruger leads British loyalists to victory against an attack of the Continental Army. May 26, 1781 - The Bank of North America is incorporated in Philadelphia by an act of Congress to help stabilize the issuance of paper currency. It was capitalized in 1781 with $400,000. September 26, 1781 - General George Washington and Rochambeau join forces near Williamsburg. Two weeks later, on October 6, they begin the siege of Cornwall at Yorktown. At the time, English troops numbered 6,000, American troops 8,846, and French troops 7,800. On October 19, British forces under Lord Cornwall surrender to Washington’s American forces and their French allies at Yorktown, Virginia. 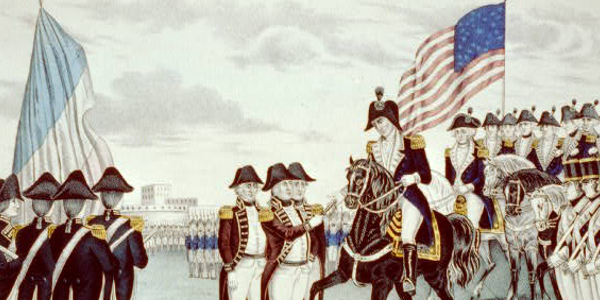 This would be the last major military battle on American soil of the American Revolution. January 4, 1782 - The Bank of North America opens its doors as Robert Morris, the superintendent of Finance, recommends the creation of a national mint and decimal coins. The bank, along with the Bank of New York and First Bank of the United States, will be the first entities to obtain shares on the New York Stock Exchange. March 20, 1782 - Lord North resigns as British Prime Minister, leading the way for a New British cabinet to agree to recognize United States independence. June 20, 1782 - The Bald Eagle is adopted by Congress as the national bird. July 11, 1782 - British troops begin to leave United States' soil, evacuating Savannah, Georgia. On December 14, they would continue their evacuation by leaving Charleston, South Carolina. November 7, 1782 - British Parliament agrees to the recognition of U.S. independence. A preliminary peace treaty, later formalized as the "Treaty of Paris" is signed between American and British officials in Paris on November 30. April 15, 1783 - Congress ratifies the preliminary peace treaty, ending the Revolutionary War. July 8, 1783 - Massachusetts Supreme Court outlaws slavery, citing the state Bill of Rights "all men are born free and equal." September 3, 1783 - In Paris, France, John Adams leads an American delegation and signs the peace treaty officially ending the Revolutionary War between the United States and Britain. November 3, 1783 - The Continental Army is ordered disbanded by General George Washington. After the British leave New York City on November 25, Washington bids goodbye to his officers at Fraunces Tavern in New York City on December 4. Noah Webster publishes the American Spelling Book, a bestseller. More than a million copies are sold of "Webster's Dictionary." Webster's Dictionary is credited for standardizing spelling and pronunciation in the United States of America. January 14, 1784 - Congress ratifies the final peace treaty between Great Britain and the United States, ending the conflict that would give America its freedom. March 1, 1784 - All children born after this date in 1784 in Rhode Island are free. Rhode Island's passage of its Emancipation Act provided for the gradual abolishment of the right to hold slaves. September 21, 1784 - The Pennsylvania Packet General Advertiser is published, the first successful daily newspaper in the United States. By the end of 1784, trade with Great Britain had returned as Britain receives its first bales of imported American cotton. November 24, 1784 - Zachary Taylor, who would become the 12th president of the United States, is born. January 7, 1785 - Dr. John Jeffries, an American physician, joins John-Pierre Blanchard, a French aviation pioneer, to become the first men to cross the English channel by air, traveling from Dover, England to Calais, France in a hydrogen gas balloon. May 11, 1785 - Empress of China, captained by John Green, becomes the first American ship to trade with China when it returns to New York after a fourteen month journey. A second journey by Stewart Dean, an Albany navigator and Revolutionary War privateer, begins December 18, 1785, further establishing the Old China Trade with the Qing Empire. Dean, on the private schooner Nimrod, had been captured by the British at St. Kitts in 1782, and later released. June 3, 1785 - The Continental Navy is disbanded. July 6, 1785 - The United States adopts a decimal coinage system, with the dollar overwhelmingly selected as the monetary unit, the first time any nation has done so. August 23, 1785 - Oliver Hazard Perry, American naval officer, is born. January 3, 1786 - The Treaty of Hopewell is signed between representatives of the Confederation Congress of the United States and the Indian nation of the Choctaw, originally located in the southeastern states of Mississippi, Alabama, and Louisiana and known as one of the five civilized tribes. July 20, 1786 - First private test of John Fitch's new invention, the steamboat, occurs on the Delaware River, a sketch appearing in the Columbian magazine in December. The first public demonstration, including members of the Constitutional Convention, is launched on Aug. 22, 1787, a ship with six large paddles, like an Indian canoe, powered by a steam engine. August 17, 1786 - American frontiersman David "Davy" Crockett is born. September 11-14, 1786 - Five state delegates at a meeting in Annapolis, Maryland call for Congress to hold a convention in Philadelphia in order to write a constitution for the thirteen states. June-July 1786 - Rhode Island farmers strike against merchants who refused to accept the depreciated paper currency. January 25, 1787 - In Massachusetts, six hundred debt-ridden farmers, led by Daniel Shays, revolt against their creditors and high Massachusetts taxes. Faced with imprisonment and the loss of their farms for not paying their debts, they engage in Shays' Rebellion, but it fails when state militia intervene. Daniel Shays would escape to Vermont with the death penalty on his head, but later would be pardoned for his actions. May 25, 1787 - With George Washington presiding, the Constitutional Convention opens in Philadelphia's Independence Hall. July 5, 1787 - A compromise during the Constitutional Convention proposed by Roger Sherman of Connecticut solves the problem of the amount of votes each state would receive in Congress. A bicameral legislature would be enacted, with equal votes for the Senate and proportional representation based on population in the House of Representatives. July 13, 1787 - The Northwest Ordinance, which determined a government for the Northwest Territory of the United States (north of the Ohio River and west of New York), is adopted by the Continental Congress. It guaranteed freedom of religion, school support, and no slavery, plus the opportunity for statehood. September 17, 1787 - Delegates to the Constitutional Convention adopt the Constitution. January 2, 1788 - States of the United States continue to ratify the U.S. Constitution when Georgia becomes the 4th state to do so. January 22, 1788 - Cyrus Griffin is elected as the last president of the Continental Congress prior to official ratification of the United States Constitution. March 21, 1788 - Twenty-five percent of the population of New Orleans perish in a tragic fire that destroyed 856 buildings and left the majority of the city in ruins. June 21, 1788 - Ratification by New Hampshire of the United States Constitution, the 9th state to do so, indicates adoption of the document by the United States. October 24, 1788 - Sarah Josepha Hale, American author of the nursery rhyme, "Mary Had a Little Lamb" and her campaign to officially recognize Thanksgiving as a holiday, is born. 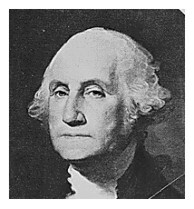 February 4, 1789 - George Washington is elected unanimously by the Electoral College as the 1st President of the United States. The 1st Congress meets in Federal Hall, New York City, for the first time on March 4, with regular sessions beginning two months later on April 6. Frederick A. Muhlenberg becomes the first Speaker of the newly formed House of Representatives. 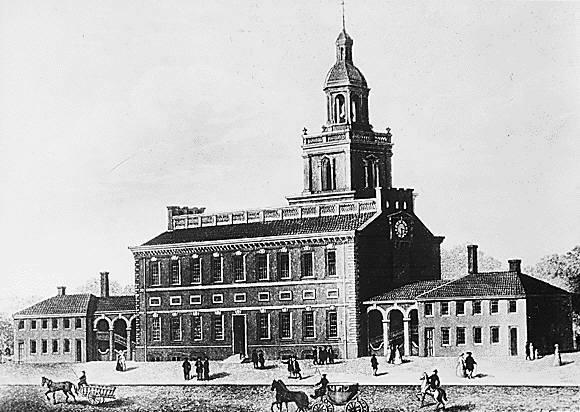 March 4, 1789 - In Federal Hall, New York City, a converted Customs House, the government of the United States under the United States Constitution begins to act. The U.S. Constitution is declared to be in effect. April 30, 1789 - The 1st President, George Washington, is inaugurated in New York City. He had been chosen president by all voting electors (there was no direct presidential election) with John Adams elected Vice President. September 24, 1789 - The Federal Judiciary Act is passed, creating the Supreme Court. September 25, 1789 - The Bill of Rights is submitted to the states by Congress. Independence Hall, Philadelphia. Courtesy National Archives. 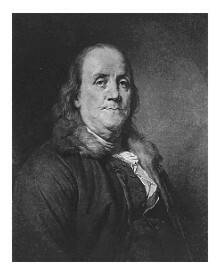 Ben Franklin, American statesman. Courtesy National Archives. 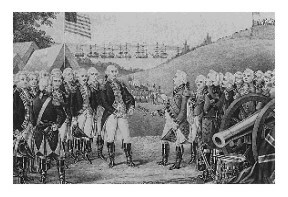 George Washington and British at the surrender at Yorktown, Virginia. Courtesy National Archives.